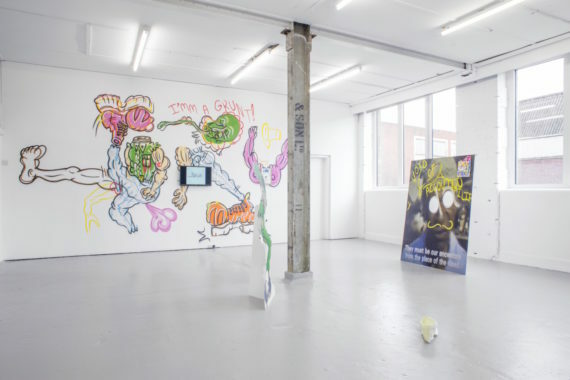 In 2013 the Birmingham-born, Glasgow-based artist Hardeep Pandhal was the recipient of the Glasgow International Open Bursary for a recent graduate, the same year he gained an MA in Fine Art from Glasgow School of Art. 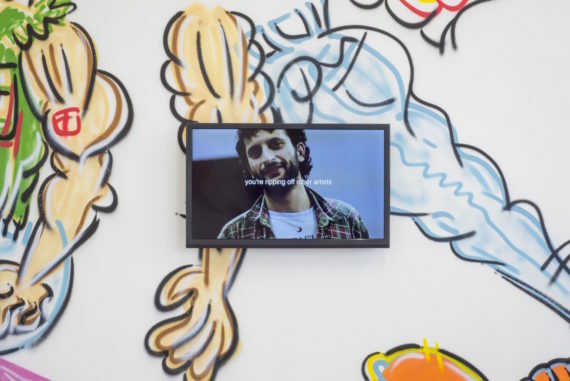 This year the Arts Council Collection has acquired three of his works on behalf of the nation and he is currently exhibiting in the fourth New Museum Triennial, ‘Songs For Sabotage’, in New York. 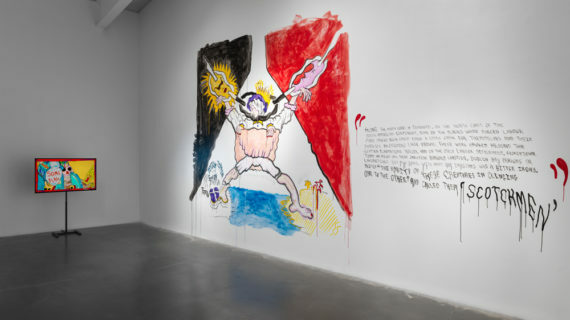 He is also one of a small number of Glasgow artists to be included in GI’s main Director’s Programme. 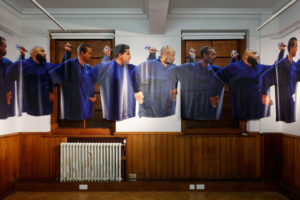 Pandhal has exhibited widely since his work was included in the 2013 Bloomberg New Contemporaries, with solo exhibitions at Castlefield Gallery in Manchester (2014), David Dale Gallery, Glasgow (2015), Eastside Projects in Birmingham (2017), Berwick Gymnasium as part of the 2017 Berwick Film and Media Arts Festival, and most recently Cubitt, London (2018). 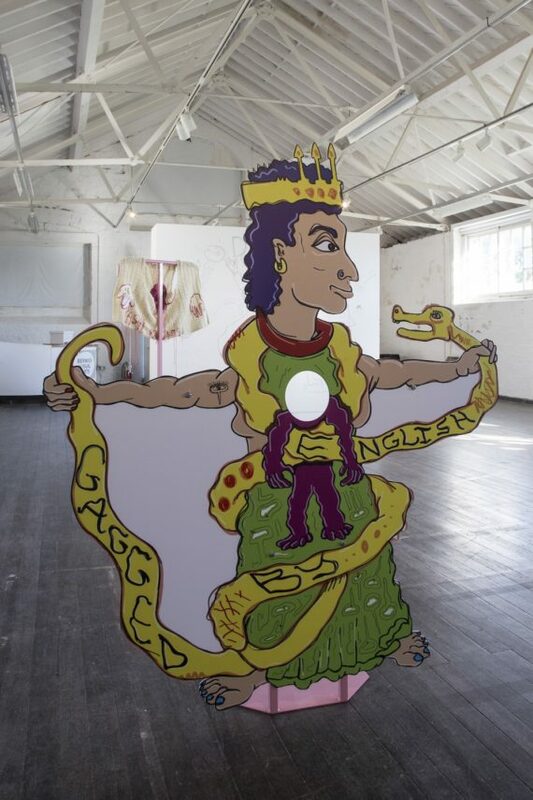 He was also featured in the group shows ‘The Vanished Reality’, Modern Art Oxford (2016) and ‘Nothing Happens, Twice: Artists Explore Absurdity’, Harris Museum, Preston (2016). 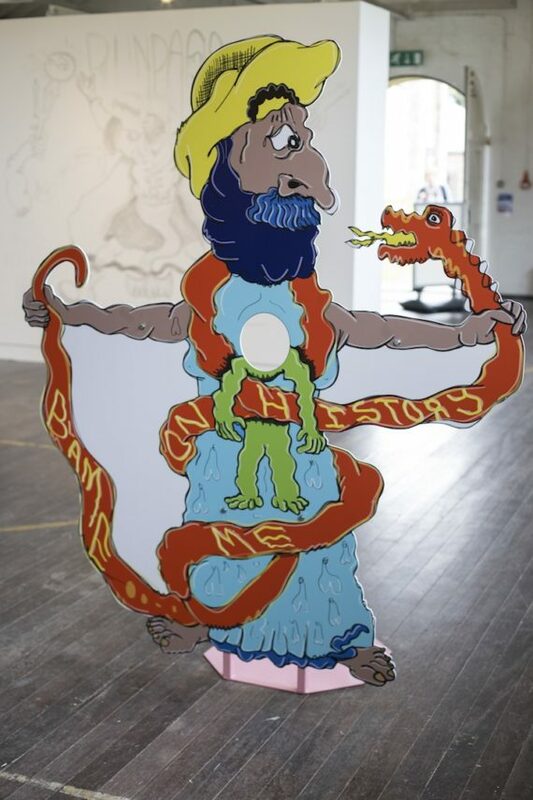 Pandhal’s work often draws on and references his own background as a second generation British Sikh. 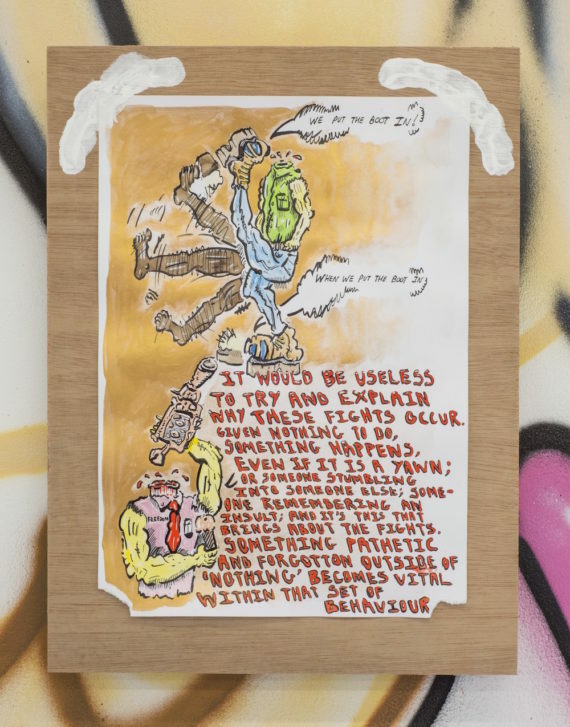 His GI exhibition, ‘Self-Loathing Flashmob’, features film, sound, drawing and sculpture and is spread across two floors of Kelvin Hall in Glasgow’s West End. You’re working in a grand two-part space at Kelvin Hall. What are you including for your GI show? There’ll be a wall with monitors in it that will play short videos on a loop – they’re not synced so there’ll be a bit of discordance. They’re all clips from a documentary I put together. The main footage revolves around students at Leeds University during protests in 2010 where they would occupy universities in response to tuition fee rises and austerity. Some of the footage is of me in the occupation, just documenting it, and some of it is short talking heads with the students where they’re reflecting on it. That’s all subtitled and I’ve picked bits that provide a picture about how conflicted and just how varying the opinions were; how chaotic it was. On the other side there’s a bigger screen with an animation I put together, which is way more subjective and exaggerated – parallel thinking I suppose. It imagines all this stuff in response to some of the things the students are talking about – the kind of conflicts they’ve got. There is a bit of humour in there but it’s also somewhere between apathetic and frustrated. So that’s the main thing really. There’s also going to be two cut-outs that have sound coming from them; a bit of spoken word I’m working on that ties it all together. Can you explain the cut-outs? Am I right in thinking they’re usually painted scenes with a head-shaped hole? I think they’re technically called comic foregrounds. The guy who invented them was apparently the same person that did the famous paintings of dogs playing poker [laughs]. So he’s known for two things. I’m trying to work out the relationship. I suppose the heads being substituted, that’s the relationship. It’s not just what the images are, it’s that these tourist things [comic foregrounds] are more associated with seaside Britain, and that conjures up its own world, time and place associations in my imagination. It’s that kind of mixing. Humour, satire and silliness often appear in your work. Why is playfulness important to you? Some of the more personal things that I’m interested in can be quite confrontational, i.e. I don’t expect it to be co-opted outside of art contexts. I don’t want to shut down the response, so the humour allows there to be a bit of a relation, basically. That’s the general idea. 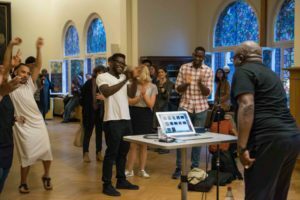 Is there an example you could give of a subject you wouldn’t expect to be co-opted outside of art contexts? Or a work you’ve made? I started making cartoon characters and one of them is based on a colonial soldier, but since I started doing that there’ve been exhibitions and way more publicised material around that history – probably because of the centenary of the first world war – so it’s become more public. Originally I probably felt that even I wasn’t sure what I was doing or where I was going, but now the context is a bit more available for that kind of work. A lot of characters that populate your work are caricatures. Can you talk a little about this? They’re exaggerated maybe in terms of it not being realistic looking, but I think you see behaviour that is ostensibly realistic in the real world that – to me – is just like exaggerated madness. I don’t understand the difference. I think the real world’s more fucked up than my work. I don’t really have a scheme or a formula about why I’ve been doing that, but there is a thing about trying to communicate through a recognisable style. I’ve not really made any reference to this space [Kelvin Hall] but it’s not arbitrary that we talked about having some of my work here. I think it offsets some of the grandeur that this place signifies. Wealth or privilege or something, I don’t know what it is. I know that Glasgow’s an empire city. You don’t even need to know that do you? You just look around and well, yeah. You spoke about the documentary format you’re using to show discordant narratives taken from student protests. Can you talk a little more about observational practices in general, or the idea of a totalising eye that’s mentioned in the exhibition text? I suppose the totalising eye just refers to authority or control or power. It’s not very specific. At the student protests a lot of what they’re talking about refers to a presence that’s restricting what they can do. There is an underlying sense that some sort of potential is not going to be realised, or that it’s going to be restricted through an overriding force. Unspecific in where it comes from, an atmosphere maybe? In that context it was just the government. And then because it’s a documentary there’s a bit of a reflection; documentary is totalising as well, or can be. There’s a bit of sensitivity around that. Even with the cut-outs, the whole point is that you pose in front of it and someone takes a photograph. Throughout the work there is a thread about observational practices: some that appear to be quite benign, some that are quite dark in various ways. Stick your head through something – take a photograph. I suppose nowadays you put it on social media or something. In the documentary you see journalists interviewing students, students talking to journalists complaining about stuff, and then obviously the protest, the larger government. There’s humour there as well? I think it’s got a human edge to it. There’s definitely a sense of conviviality about the way it’s done. There’s pleasure. You can see people having pleasure in the video, and I’m trying to have pleasure in making the work as well. So do you feel a sense of social responsibility since you’re also in the business of representing things and people? Yeah, I think so but I haven’t really got at this point a clear position on the project really. I’m using the exhibition space to make stuff so it’s hard to decide on one thing at the moment. When things are finished I’m going to have a clearer idea about its relationship and its relevance or what it’s proposing. A lot of it has propositional bits. The thing about my work is I have a lot of text and a lot of sound. There’s a lot of interpretation in the work and I’ve always been conscious of that. It’s like it pre-empts interpretation. There’s a lot of content in there and there’s a lot of stuff to look at, to read and to listen to, so it’s not too ponderous. You’re working with a light touch? Some works do require a lot of interpretation, but my work tends to be quite confrontational. As long as you can read, listen or understand English and are not blind then you should be able to look at it. Some of the text I’m going to write will play up expectations, or have the presence of a museological guide, you know; ‘this is this’ or ‘this means this,’ playing off that language. I think that playing around with expectations is part of it. There are approaches to art which don’t do that at all. You go and revere something, go and respect something. But this isn’t like that really. It’s just presenting thoughts and ideas. That’s it: a proposal. It’s all just improvised.